The Vintage Hamadan Rug Collection brings a refined look of antiquity to modern home decor with richly colored Persian styled carpets. Classic motifs are vividly displayed in distinctive hues and finished in an antique patina to instill vintage qualities in every uniquely designed rug in this sublime collection. The perfect decorative centerpiece for any room, these rugs bridge contemporary lifestyles with ancient charm. Well... let me begin by saying that this rug exceeded my expectations! I purchased the 8x10 size. Love the design..the colors are true and rich ..will definitely give your room energy. (if you are looking for a muted or vintage look this rug is not it). The feel underfoot is more plush than the carpet I have in my bedrooms that I paid $2K for. I am very pleased with this purchase....I love it! Excellent value. Vibrant colors (truly so)... Has plush feel and goes with any traditional furniture ensemble or as an accent element in a modern, chic decor. To be clear, this is not a Tajik/Persian carpet, but will honestly serve your purpose until you can drop $20k for an original... I am quite pleased with my purchase. I love this rug. 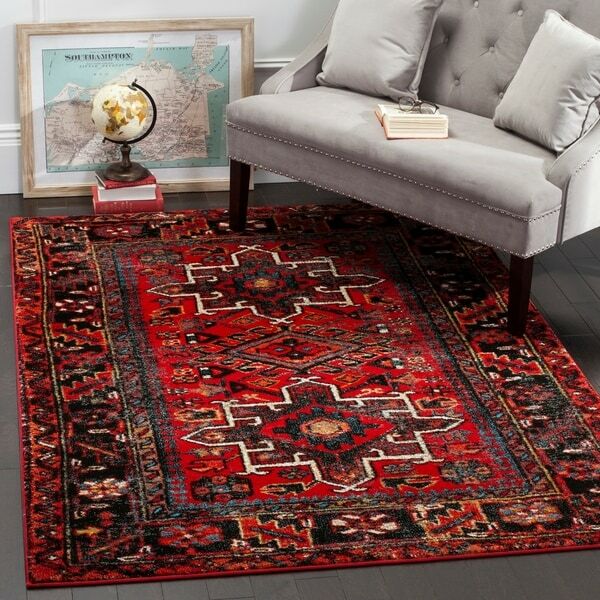 I agonized over buying this because I was afraid it wouldn't look rich and vintage.The beautiful rug exceeded every expectation I had.It looks great with my white couch and is vivid and soft. You can't go wrong with this rug! This rug is fine, but I was kind of surprised by the intensity of the colors. I assumed the "vintage" style would be more muted/faded but it is actually composed quite bright and vibrant oranges and reds. Wanted a durable synthetic rug for an enclosed porch area that would hold up well to traffic and wear. 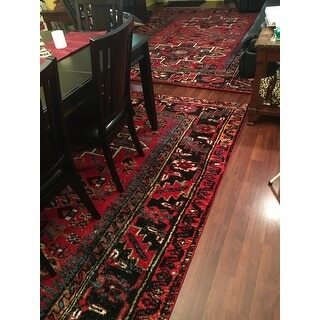 Size fits area perfectly, colors are vibrant, but the fineness of the pattern detail is rather course compared to the other two "real" Persian rugs I have in the house nearby. Still happy with it - serves its purpose and looks ok, but it aside from the brightness of the colors, it is pretty much like any other polypropylene oriental style rug. Love this rug!! Super vibrant and super soft!! Amazing pattern and variety of colors. Easily coordinates with any item or decorating style. 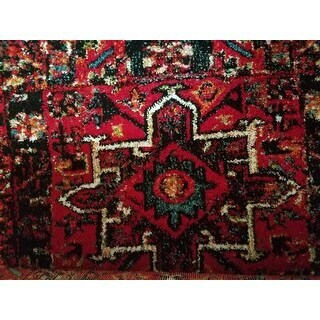 Bought another in a larger size for another room as well as a larger coordinating rug and 2 runners. Very happy with my purchase. Colors are as they are described on the website. I have had this rug for a few months now. I don't have any issues with shedding. Yes, the pattern is not crisp, but it is still absolutely lovely. The red is bright and vibrant and go great in my renovated mill apartment. Its soft and nice and thick as well. The quality and the price is right. If you are debating on whether to purchase this product, I highly recommend it! I'm very happy with my rug purchase. It shipped very quickly, and the text updates were really handy. The rug itself is very soft and beautifully made. It feels great underfoot. From the pictures, it looks like the most dominant colors besides red are the yellowish beige and the black, and I didn't realize how much light blue and white coloring is in this particular rug, but it goes with our decor so I don't mind that. Overall, I'm very happy and I will be purchasing from Overstock again. Love this rug the rich color and density is superb. Great colors and feels nice on my bare feet. Showcases my peacock blue couch. It's better looking in the picture i guess ..but for the money you pay its ok ..but good to use for a year or 2 then get red of . Such a great rug! Compliments every color. I love this rug.. the bigger the better. The colors are perfect, lots of blue, red, and even orange. It's my most favorite rug I have ever had. Perfect rug! Made very well ! I got the 8x10 and it’s lovely! This rug was a nice surprise,you never know when you don’t see and touch something in person. Our living-room looks more pulled together and it has held up well in a house with young adults and dogs. This rug is perfect. It’s quite soft and squishy beneath your feet. No pad was necessary. The color is vibrant and exactly as pictured. This arrived packaged professionally, and laid flat immediately. Lovely area rug. This rug holds up well in a high traffic area of our house. It also gives the illusion of being clean, which is amazing in our house of two dogs and a toddler. 4 stars because I do wish the print was a little more authentic, but overall I think it looks great. "is this indoor outdoor or just indoor"
This rug is not intended for outdoor use. "What colors are in this rug? " This beautiful rug has shades of red, orange, black, blue, gold, green, white and blue. Because I purchased a similar rug from the same manufacturer and it was true to its representation, and I needed another rug for another room. "Is the rug as badly discolored as the first photo? The other images do. It show that discoloration." 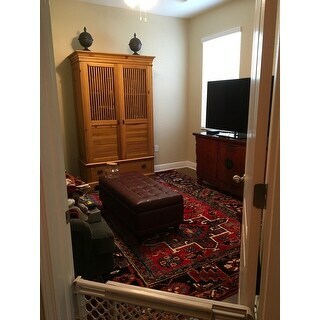 The room shots are the more accurate representation of the rug as it is the most recent.